Basic colour: Head and elytra bright metallic blue, pronotum orange. Leg colour: Black with paler middle of tibiae and and base of femora. UK Priority Species data collation for Lebia cyanocephala. Status: Very scarce. Local in southern England. Only recent records from Surrey. Habitat: Dry sandy grasslands and heaths. Host plant: Hypericum perforatum. This species parasitises the beetle Chrysolina hypericae which feeds on Hypericum perforatum (St. John's Wort). Other notes: Elytra with straight sides, diverging to near apices; intervals punctured more strongly than the fine striae; outer intervals pubescent, partly obscuring the marginal pores. Denton, J. (2003). 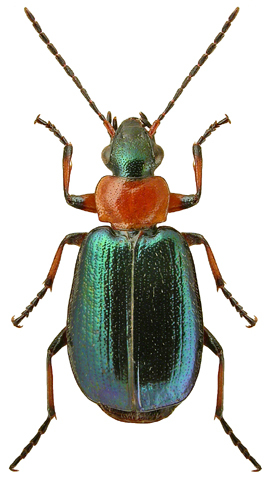 Belated records of Lebia cyanocephala (Linnaeus) (Carabidae) in Hertfordshire. The Coleopterist 12(2): 56. Denton, J. (1998). Lebia cyanocephala (Linnaeus) (Carabidae) rediscovered, in Surrey. The Coleopterist 7(1): 17.